The large wind tunnel was responsible for testing many of the nation's bombers and fighters during World War II. In this historical photo from the U.S. space agency, the 30 x 60 Foot Tunnel is under construction in August of 1930. Smith J. de France, a NACA engineer, was in charge of the design team for the new tunnel. Planning involved the construction of a 1/5 scale model of the tunnel. In 1929, the NACA received congressional approval and two year appropriation of $900,000 for construction. The tunnel was built by the J.A. Jones Construction Company. The framework is solid steel. 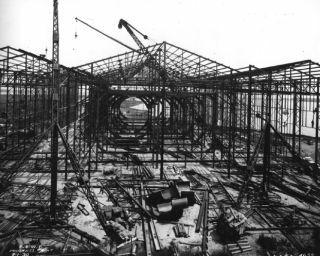 Like many early wind tunnels, the 30 x 60 foot tunnel featured "inside-out" construction, with structural supports on the outside. The circular frames indicate where the two 35 foot propellers are located today. Built to test full-scale models or actual aircraft, the 30 x 60 foot tunnel was an innovative concept in wind tunnel design. It proved especially valuable during World War II as a majority of the nation's bombers and fighters (as well as several foreign aircraft) were tested in this tunnel. Since the 1970s, one of the unique test techniques used in the 30 x 60 was free flight of dynamically scaled models in the test section. This technique allowed researchers to measure and assess flight characteristics as well as control options. The 30 x 60 is an example of a major facility adapted to serve a multitude of uses that its designers did not initially visualize. The 30 x 60 remained as one of NASA's largest wind tunnels until its closing in September 1995. In 1985 the 30 x 60 foot wind tunnel was designated a National Historic Landmark.